After being initially being turned away at the door for what I suspect was too “owl-like of an appearance”, I was only able to gain entry into this fine Roscoe Village “Pizza + Wine Bar” eatery after returning in a trench coat, straw fedora, and what I can only describe as a “comically over-sized mustache.” Needless to say, these lengths are not always convenient to attain. Although, my experience will quite possibly not resemble your own, as I’m an owl, I would insist you not visit Frasca’s unless you have enough time to make at least one if not two costume changes to ensure your entrance into the restaurant. I wish I could say that was the end of my troubles. Unfortunately, after finally being seated, the waitstaff repeatedly kept asking if I was an owl in a trench coat. And although their level of suspicion was warranted, me actually being an owl in a trench coat and all, their constant questioning and the passive aggressive way “there are no field mice on the menu” was mentioned seemed irritatingly non-confrontational and unprofessional. This behavior continued throughout the meal, tainting what otherwise was a fantastic dining experience. I was there on a Sunday evening, so I enjoyed their three dollar draft specials. They have a different daily special most days of the week, including 1/2 priced bottles of wine on Mondays. The full breakdown as well as their menu can be found online at: www.frascapizzeria.com. 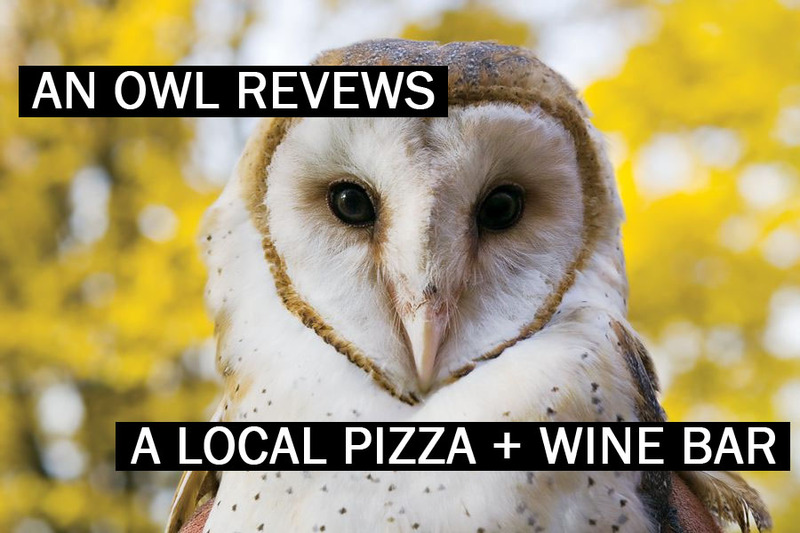 I will say, they had a nice mini selection of craft beers to choose from (wine is obviously being more of their specialty being a “Pizza + Wine Bar”), but they didn’t have many “Easy Owl Access” glasses to drink from. I’m an owl, so it’s just difficult for me to drink from your “human cups.” I essentially have to raise the glass above my head and use gravity to help me out. That’s fine when I’m having some craft beer selections, but I would have looked ridiculous doing that with a human wine glass. The Frasca Fondue turned out to be an excellent choice for an appetizer. It was an italian fantina and reggiano cheese fondue blend with toasted bread, apples, and sopressata to dip. I actually used some of the same bread they brought me initially with olive oil, as that was much softer and soaked up the fondue quite well. I didn’t quite enjoy the apples with the fantina and reggiano blend, but they were a nice palette cleanser after. Also, if you haven’t had sopressata before, picture thinly sliced field mice with a spicy twist, I don’t have to tell you, it’s delicious and pairs well with the fondue. For the main course, I chose a simple pepperoni pizza, which comes with tomato sauce, pepperoni, soppressata (again, think of thinly sliced field mice), and fresh mozzarella. I spiced it up with some goat cheese as well. It turned out to be a wonderful choice, and I had plenty to take home. As an owl, I was strongly tempted to do some ‘mantling,’ where I take my wings and shield the food I’m eating to protect it from other predators, but I remembered my surroundings and ignored the urge to do so. If you can get past this restaurant’s clear anti-owl bias, Frasca’s will be a great night out. Bad service notwithstanding, I highly recommend Frasca’s. 3.5 out of 4 Hoots.